Bijan Choudhury (b. 1931) studied at Govt. College of Arts & Crafts, Calcutta from 1945-49. He was expelled before completing his Diploma due to his deep involvement in politics. In 1953 he transferred and graduated from Govt. Institute of Arts, Dhaka. 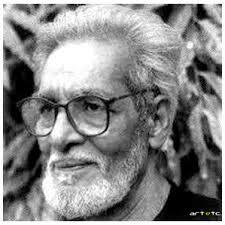 Choudhury was one of the artists that formed the Society of Contemporary Artists in 1960. He was the Principal, Indian College of Art and Draftsmanship, Calcutta – 1976-1980. Bijan Choudhury was an Indian visual artist who has had several gallery and museum exhibitions, including at the DAG Modern, New Delhi (2017) and at the Bengal Gallery of Fine Arts, Bangladesh, Dhaka (2015), Retrospective, Art Heritage, New Delhi (1986). His major collections are with National Gallery of Modern Art, New Delhi, Gaganendra Art Gallery,West Bengal and Jane and Kito de Boer, Dubai. He received William Carey Award, Abanindra Puroshkar, Govt. of West Bengal, (1995). He passed away in 2012.